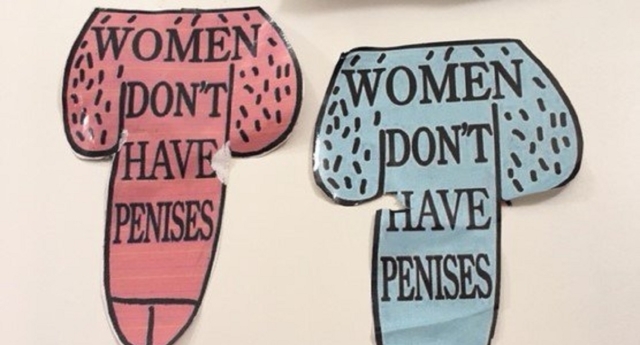 The use of anti-transgender stickers bearing the words “women don’t have penises” has spread to Canada. Canada’s national broadcaster CBC reports that stickers similar to the ones used in the UK recently are being used to target the gender-neutral toilet facilities at Memorial University of Newfoundland. A statement from student union president Gary Kachonoski said: “Recently we were made aware that material carrying transphobic messages has been posted on doors and walls around the St. John’s campus, including in gender-inclusive washrooms. “Memorial is committed to providing a safe, respectful environment for all members of the campus community and these messages do not align with our values. “We strongly condemn and will not tolerate hateful speech directed towards members of our community. Anti-transgender feminist activist groups across the UK have recently adopted the tactic of using packs of stickers to display their messages in prominent public places. Similar stickers were previously used to target London-based LGBT+ charity Stonewall, which has several transgender employees. Transgender Trend previously apologised for producing a sticker set after the group’s suggestion that it was a “good idea” for children to put the stickers on their school notebooks was met with hostility. Transgender Trend said: “Although we obviously never intended our stickers to be used in schools, we understand people’s concerns that they could be used to create conflict between students. Several other anti-transgender sticker sets are still available to download from other sources. Several have been shared by users of online forum Mumsnet, which has become a hotbed of anti-transgender activism.